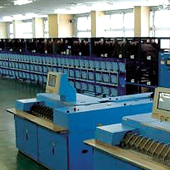 The Tsubaki Mail Sort is a machine specially designed to sort standard and nonstandard-sized mail. Until now, it has been necessary to sort mail in three steps, from large, to medium, to small items. However, the Tsubaki Mail Sort system dispenses with the extra steps, sorting all sizes in just one step. Freely adjustable layout of racks enables mail to be sorted by post code, branch office, driver, or department etc. Post offices, banks, transit companies, mailing companies, etc. Postal materials, mail, fliers, pamphlets, etc.